So you’ve got you XML Navigation set up and ready to go on your SharePoint 2010 Site. 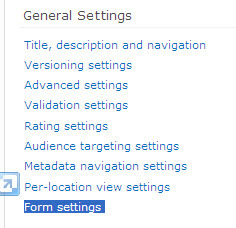 You log into your site and now you noticed that the XML has no idea what site you are on and so the Top Navigation Tab isn’t selected (highlighted) when you click on a site and some of your end users use this as a queue to know what site they are on because it stands out a little more than the site title. The Steps below will get you your XML Navigation implemented onto the Master Page and all of the tools that will help you control the behavior of your navigation. Now you will want to change the Data source from DataSourceID=”topSiteMap” to DataSourceID=”DemoXmlDataSource”. Now I will need to properly create my XML Navigation with URL’s that will allow me to highlight a tab when it has been selected on the SharePoint site. The main rule is that you will need to use the entire url for your site in order for this to work. So instead of having http://yoursharepointsite you will need to have http://yoursharepointsite/default.aspx or whatever the entire path is to the aspx file for your landing page is on your site. The limitation that should be noted is that the top nav items will only be highlight when you are on the root level of each site collection or sub-site. Now we will need to reference and create some JQuery to allow for the magic to happen. We will be using jquery-1.6.1.js for this tutorial. So that file will need to be referenced in your masterpage to get the JQuery to work on the Top Navigation Highlighted selection. Let me explain my file location that you see above. When I create a master page solution I put my JQuery files into a folder called jquery that will be deployed to the layouts directory on my server. I will be including a Master Page Solution at the end of this posting that you can deploy to your site and all of the files can be edited to your liking. The XML Navigation created to use in this solution will be deployed to the directory: C:\Program Files\Common Files\Microsoft Shared\Web Server Extensions\14\TEMPLATE\LAYOUTS\XMLNavigation on your server. There you can change and experiment with the URL’s on your site to create the selected tab. What you see below is the example XML Navigation file’s contents. Also a virtual copy will appear in the _catalogs/masterpage folder on your Site Collection once you deploy and activate the Feature. If you are using the supplied WSP file you will have to manually update the XML file to have your website url’s for this Solution to work, but I wanted to supply this to help get you started. A solution package is a distribution package that delivers your custom SharePoint Server 2010 development work to the Web servers or the application servers in your server farm. Use solutions to package and deploy custom Features, site definitions, templates, layout pages, Web Parts, cascading style sheets, and assemblies. In SharePoint 2010 it is easy to create a .wsp file using visual studio 2010, which was previously very difficult in MOSS 2007. To deploy any solution package in any local environment in Visual Studio 2010 simply right click on the project and deploy. But to deploy the same thing in the production server we will need to deploy through .wsp file. project/solution in debug mode then you will get the .wsp file inside the Bin\Debug folder and if you are building the project in release mode then you will get the .wsp file inside the Bin\Release folder. This wsp file is needed to deploy in the production environment. This is the best way to create the wsp file in visual studio 2010. 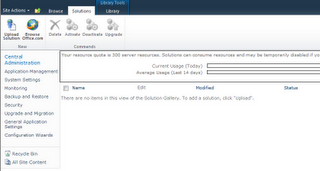 Go to the Central Administration -> Site Actions ->Site Settings -> Galleries –> click on Solutions. After this the below page will open as shown in the figure. 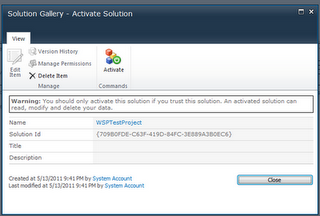 Click on Upload solution and then browse to the wsp file as shown below in the figure. Once you will click Ok then activation window will appear like below figure. Then you can use the solution. Open the SharePoint 2010 Management Shell. 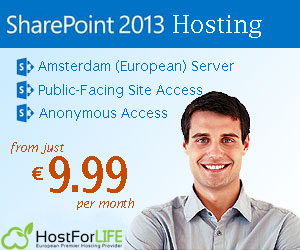 You can get to this by going to Start > All Programs > Microsoft SharePoint 2010 Products > SharePoint 2010 Management Shell. SharePoint 2010 Foundation problems encountered when doing a quick spin-up of a test instance. To allow the search service to start the credentials assigned to the service were changed from Local Service to Local System. To fix the “not assigned to indexer” error use Central Administration. Make sure you have the correct web application selected and click on the content database. Scroll down and find the Search Server section and select the search server from the drop-down. The default SharePoint 2010 list forms (DispForm , EditForm & NewForm) are quite generic (as they were with previous SharePoint versions).. Wouldn’t it be great to be able to customize the look & feel of them? 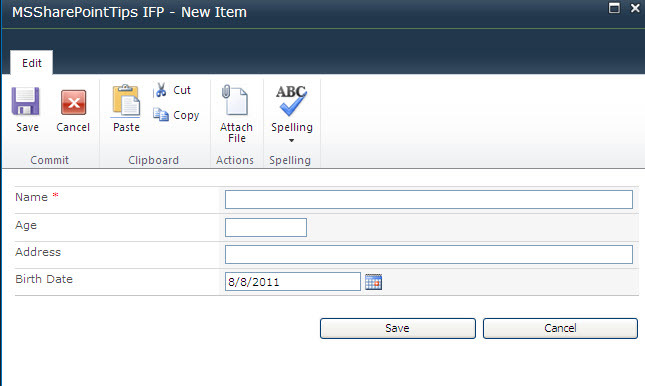 Microsoft InfoPath 2010 makes designing and publishing electronic forms easier than ever. InfoPath enables you to create powerful, interactive forms without writing any code. With a few clicks, an Office user can customize SharePoint list forms, add custom layout elements, and add business rules to validate the data. 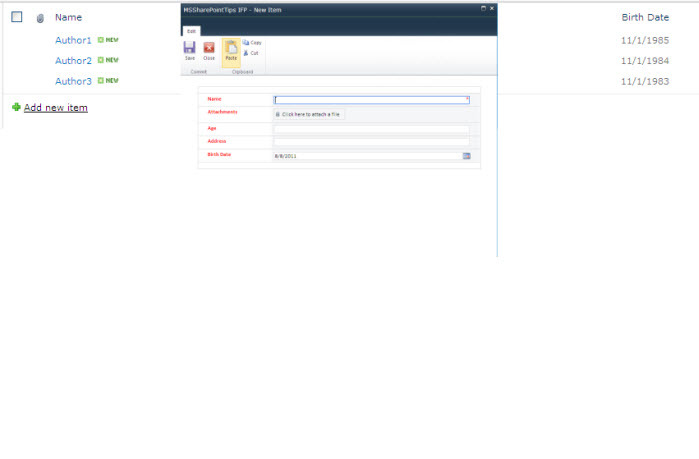 In addition to working with the forms online while connected to SharePoint Server 2010, you can also take the list and associated forms offline, and then work with the forms in SharePoint Workspace. InfoPath is based on Extensible Markup Language (XML). When you design a form template, InfoPath creates an .xsn file, which is a cabinet (.cab) file that contains the files necessary for the form to function, such as XML Schema (XSD) and XSL Transformation (XSLT) files. When a user fills out a form in InfoPath, the data in that form is saved or submitted as industry-standard XML. However, you don’t have to know anything about XML to design a form template or fill out a form. The point is that XML can make it easier for your organization to repurpose the data that it collects by using forms. – Here’s the form after applying a set of customizations in preview mode. Click on “Close Preview” button. b) The Search Core results part should just show sites (not documents) that the current user has access to. 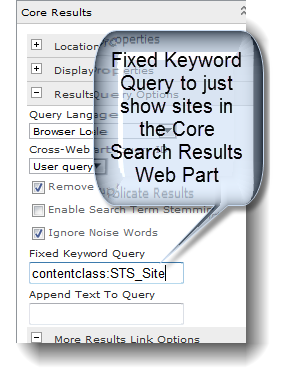 Requirement b) was simple – you can set the keywords on the Core Search Web Part to just display sites (using the “contentclass:STS_Site” keyword in the “Fixed Keyword Query” property – and the part would default to showing a list of sites the current user has access to (via the normal SharePoint 2010 security trimming functionality). However, the first requirement was a little bit trickier. The default Core Search Web part only provides for 2 search sort options – by date and by relevance (which is the default). To fix this, the XSLT which defines the search results needs to be changed. This XSLT is specific to the instance of the web part – modifying it won’t affect the normal search functionality of your site. 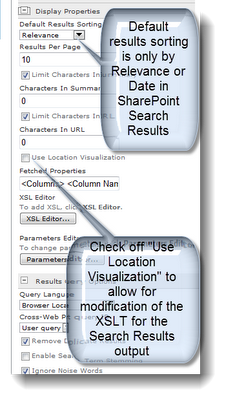 To modify the XSLT for the search results web part, you need to first uncheck the “Use Location Visualization” checkbox. The XSLT that opens is around 700 lines long and has a lot of different XSL templates defined within it. To sort the search results by alpha order, you need to use an xsl-sort call within the main apply-templates call. Another limitation of this approach is that it will only work on a non-paged resultset – which is a pretty major limitation! In our scenario (for Phase 1 of our provisioning solution), it was acceptable for our customer to increase the page size to avoid any pagination from occurring. Your mileage may vary. and the jQuery approach above for easy inline searching of accessible site collections. of the method then you need to create a custom web service. Below are the steps how you can create a custom web service. Create an asp.net web service project in the visual studio. Name the project as TestServiceProject and rename the Service1.asmx file to TestWebService.asmx. can go to the TestWebService.asmx.cs page and define a web method. 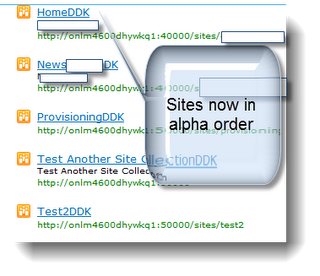 In Solution Explorer, right-click TestWebService.asmx and select View Markup. Now host this application in your IIS. Now we need to generate the .disco and the .wsdl files. To generate the .disco and .wsdl file we need to run the disco.exe command. Now save the two files as TestWebServicedisco.aspx and TestWebServicewsdl.aspx. To include the Web service in the list of web services on the server, open the spdisco.aspx file which is present at “C:\Program Files\Common Files\Microsoft Shared\web server extensions\12\ISAPI” and add the following within the discovery element. Now deploy the TestServiceProject.dll to GAC and the bin directory of the site on which you want to use the web service. Now you can consume the web service like the out of the box web service provided by SharePoint.